Like Papa said in this post, I was really into doing timelapse videos this trip. I compiled a few of them into a montage video for your viewing pleasure. Caden got a video camera for Christmas a few years back, Dacen got an action cam for this last Christmas, Steph has her Nexus 5X which takes amazing pictures, I just bought us a new mirrorless camera and so Brielle took over the old point-and-shoot. Armed with 5 cameras we headed off on the hunt for the best photo, the best attempt at capturing a moment in time. Our destination, Colorado National Monument, was about 1 mile from the campground. We paid for an annual National Parks pass and headed up the road. 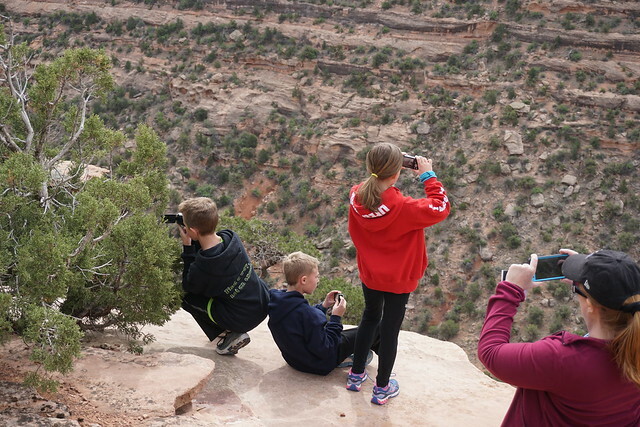 Just as you enter the beautiful Fruita canyon is a pullout for viewing Balanced Rock. We also notice some big horn sheep, so before the truck has even come to a complete stop the doors swing open and the mighty hunters jump from the vehicle with cameras aimed and the snapping of shutters commences! I think we spent close to an hour at this one point and took a crazy number of pictures. Thursday morning after a walk around Golden Ponds with my brother, the dog and I took the Beast up to get Ava. As we rounded the last corner the Beast bucked just a little bit as though he couldn’t wait to hook up with Ava again. Sheba was in heaven running around with the farm dogs and the cat while I hitched up for the short ride to Longmont to get Ava packed up for our little spring break trip to the western slope of CO and the Moab area. It has been dry as a bone and in the 70s most of March and the ONE day we’re going to be driving with a 38ft, 14,000 pound trailer over the Continental Divide the forecast calls for snow. Well, Friday morning came with pretty clear skies in Longmont and the forecast was clear all day. We pulled out about 9:00 and had smooth sailing the whole way. 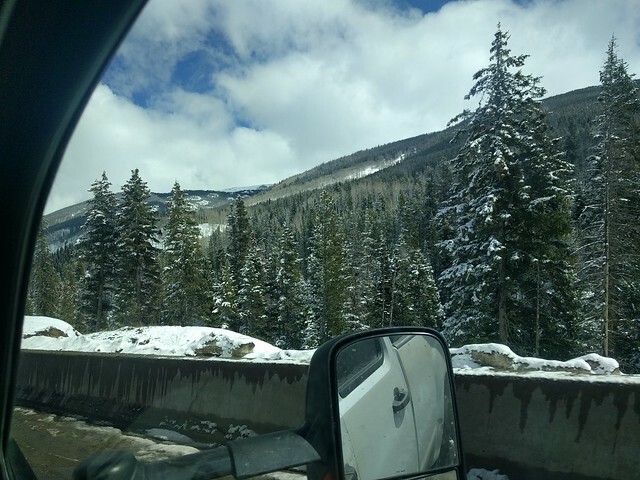 There was fresh snow in the mountains but I-70 was dry until right before Eisenhower tunnel where the roads were wet until Silverthorne…then again they were a little wet on Vail pass. Nothing slick, nothing scary. It really looked quite pretty with the fresh snow and the blue skies. It was a good drive and it felt good to be on the road again with the family…including our new addition, Sheba, our trusty pup. I’m not really sure what Sheba thought of the ride…she was very restless the whole way….just couldn’t seem to settle in and get comfortable. She is usually pretty chill in the car but I think the chucking from the trailer just made it a bit rougher than she likes. But she did fine as I think she was just happy to get to come along with us.